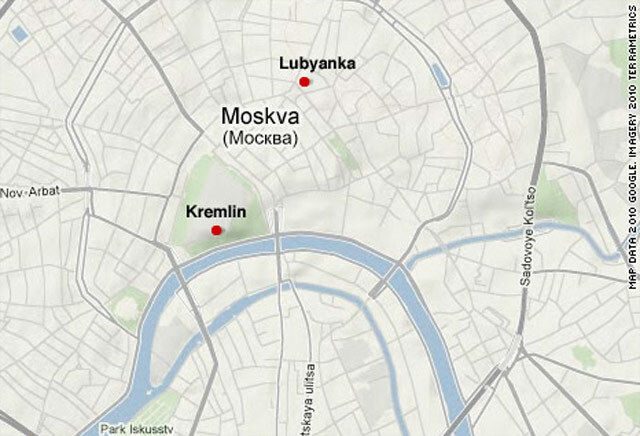 Moscow, Russia (CNN) -- Russian investigators combing two subway stations attacked by female suicide bombers think Chechen rebels may have been behind the rush-hour strike that killed dozens of people. "Our preliminary assessment is that this act of terror was committed by a terrorist group from the North Caucasus region," Alexander Bortnikov of the Federal Security Service said of the investigation at one of the blast sites. "We consider this the most likely scenario, based on investigations conducted at the site of the blast," Bortnikov said. "Fragments of the suicide bombers' body found at the blast, according to preliminary findings, indicate that the bombers were from the North Caucasus region." The two explosions that rocked the subway stations in central Moscow during rush hour killed at least 38 people and wounded more than 60 others, spawning widespread public outrage. "It's disgusting," one witness said. "I don't know who did it and what they wanted. Life is so short. How could people commit such terrible acts?" Although they have yet to claim responsibility, Bortnikov's statement is a strong implication that Chechen rebels fighting for independence were behind the strike. Thousands have been killed and 500,000 Chechens displaced in the Chechen rebels' almost 20-year conflict with Moscow. The area is in the North Caucasus region of Russian between the Black and Caspian seas. Yulia Shapovalova of Russia Today TV was at the second station at the time of the blast. "The staff members started urgently evacuating people, so that meant they probably knew about the first blast at the Lubyanka station," she said. "All the people -- a huge crowd of people -- slowly started to move. ... As soon as I got upstairs, I heard the blast." 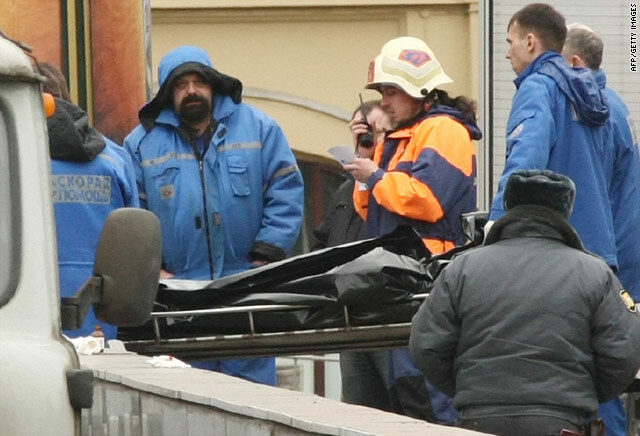 "It was a terrorist act carried out by the female suicide bombers," Moscow Mayor Yury Luzhkov said of the first and most lethal explosion, citing the Federal Security Service. "They were specifically timed -- for ... the train was nearing the station -- to make the most damage." Both stations reopened about 5 p.m. Moscow time, according to Veronica Molskaya from the Press Service of the Russian Emergencies Ministry. In St. Petersburg, three metro stations were shut as the result of a bomb scare. "I feel scared," one woman said on TV. "I have to walk to get to work, because there is no way I'm going by Metro." The attacks reverberated around the globe. U.S. President Obama condemned the "outrageous acts" and passed along his condolences. "The American people stand united with the people of Russia in opposition to violent extremism and heinous terrorist attacks that demonstrate such disregard for human life," Obama said. Secretary of State Hillary Clinton said she will offer her condolences to Russian Foreign Minister Sergey Lavrov on Monday in Ottawa, Canada, where the Group of Eight foreign ministers are meeting to plan for the June G8 meeting in Canada. "This brutal assault on innocent civilians is another reminder that terrorism is a threat to peace-loving people everywhere and must be met with unwavering resolve," she said. "Together with our G8 partners, we will discuss how to further strengthen international counter-terrorism coordination and cooperation." State Department spokesman P.J. Crowley said Monday that there have been no reports of U.S. citizens killed in the Moscow attacks. The federal Transportation Security Administration said there is "no specific or credible information indicating an imminent or current threat to U.S. transportation systems," even though some local authorities have decided to beef up security measures in some cities. New York Police Department Deputy Commissioner Paul Browne said police are stepping up security in the New York City subway system. In Washington, Metro, the operator of the city's transit system, said it is expanding security in light of the Moscow attacks. Coincidentally, it had a terror drill this past weekend and is holding another one Monday. Amtrak, the national passenger rail network, said there is "no specific threat " to its system, but its police assigned to the FBI's National and Regional Joint Terrorism Task Force "remain informed regarding any potential threats and other security issues." In Atlanta, Georgia, MARTA's police department has heightened security measures throughout the transit system. British Prime Minister Gordon Brown said he was "appalled" by the incident and sent condolences to Russian President Dmitry Medvedev, according to Britain's Press Association. U.N. Secretary-General Ban Ki-moon condemned the attack and said he "is confident that the Russian authorities will bring to justice the perpetrators of this heinous terrorist attack." Interpol, the international police agency, condemned the attacks and offered help to Russian authorities in the investigation. Interpol's executive director of police services, Jean-Michel Louboutin, called the actions "despicable and senseless attacks targeting the public." CNN's Matthew Chance, Paul Courson and Eddie Demarche contributed to this report.